We are pleased to introduce ourselves as ‘Star Fly Ash Brick Works’ & ‘Star Enterprises’ engaged in manufacturing and supply of construction and building allied products such as Fly ash bricks, Fly ash blocks, Bricks, Hollow Blocks, Solid blocks, Cellular Light Weight Concrete Blocks (CLC Blocks), Clay bricks. 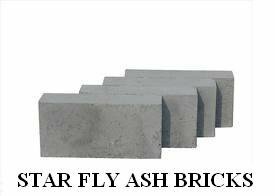 We Manufacture & supply Fly Ash Bricks in Chennai & Tamil nadu. These are fabricated at our site using finest quality of Fly ash (Carbon less), to ensure their durability, reliability and eco-friendliness. Owing to the high compressive strength and low water absorption quality, Fly ash bricks find huge application in construction industry. Manufactured as per the Construction industry norms. Mixture of: Gypsum 10 lime 15 Dust 20 Cement 5 Fly ash 50%. Use of Fly Ash Bricks made Mandatory by Government of India (MOEF) for all Construction Activities by Government, Semi Government Organizations, Public and Private Sector.